Frame Free Euro Design - The Ideal Choice For The Consumer Who Understands The Benefits of Fluid Support, Yet Seeks To Move Toward A More Conventional Look. 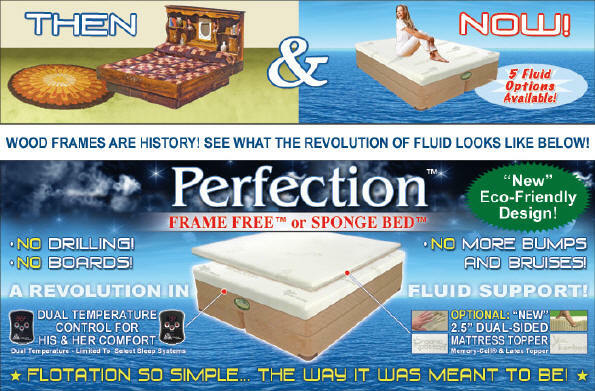 The Frame Free Euro Design Eliminates Hard To Enter and Exit Traditional Wood Frame (Waterbed) Designs. 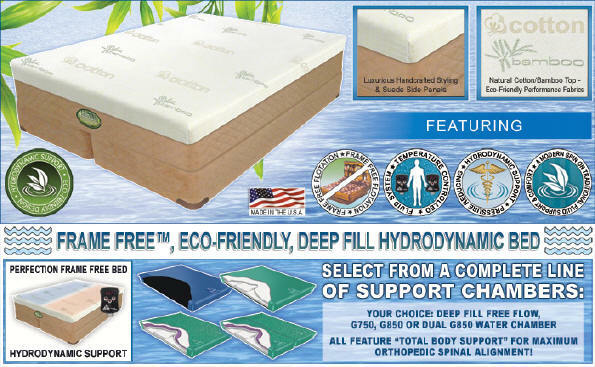 Side 2: The Finest of Talalay 5-Zone Latex For Proper Spinal Alignment Inside A Luxurious Earth-Friendly Bamboo Fabric Cover. For More Info. On This Incredible Topper - Click Here. Side 1: Genuine Natural Pour Memory-Cell® Covered With Organic Cotton Fabric For Superior Conforming Comfort. Genuine 5 lb. Memory-Cell® Formulation. Self-Adjusting Personal Comfort. Memory-Cell® - Body, Shape and Temperature Responsive Material. Progressive Support Mid and Substrate Layers Consist of Reflex® High Density, High Resilience Bio-Based Cushioning Support. Health Smart™ & Earth-Friendly™ Natural Organic Cotton Knit Top For A Hypoallergenic Sleep Environment! 100% Talalay™ Latex Gently Contours To The Body To Promote Proper Support and Pressure Reduced Sleep. Top Layer of Body Contouring Natural Latex Creates An Incredible Responsive and Resilient Sleep Environment. Natural Latex Senses & Responds To Your Body's Weigh & Conforms To The Exact Shape of Your Body. Health Smart™ & Earth-Friendly™ Natural Bamboo Knit Top For A Breathe-Easy, Hypoallergenic Sleep Environment! Hypoallergenic, Removable, Refreshable, Cleanable Cover. This 2.5" Dual-Sided Topper Comes In A Roll-N-Tote™, Reusable, Earth-Friendly Circular Bag/Package That Is UPS Shippable!